The latest innovations in nanomedicine for cancer were presented and discussed in front of an audience of more than 50 researchers, clinicians and students and industry professionals. 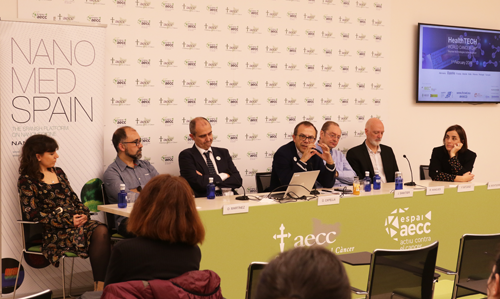 The other speakers were Vanesa Abón, from Fundación Científica AECC; Ramón Mangues founding member of Nanoligent/Group Leader at IBB/Sant-Pau; Núria Montserrat, Group Leader of IBEC; Francesc Mitjans responsible of the biomedicine unit of LEITAT; Óscar Martínez, Group Leader of IDIBELL and Gabriel Capellá of IDIBELL/ICO. They presented various new advances in the field and what they may imply in terms of new opportunities in diagnostics and therapies against cancer. Austria, France, Germany, Ireland, Israel, Italy, Poland, Portugal, Spain and Turkey were also holding events simultaneously on Nano World Cancer Day, each attended by nanomedicine experts from each country and from different backgrounds including researchers, physicians, oncologists and entrepreneurs. The HealthTECH World Cancer Day was first held in 2013 and is organized at European level by the European Technology Platform for Nanomedicine (ETPN) under the European project NOBEL (continuation of the ENATRANS project) and locally by the different members of the ETPN in each country.